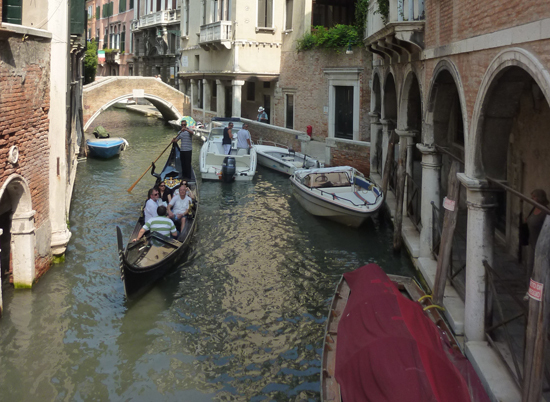 Have you ever gone for a gondola ride in Venice? 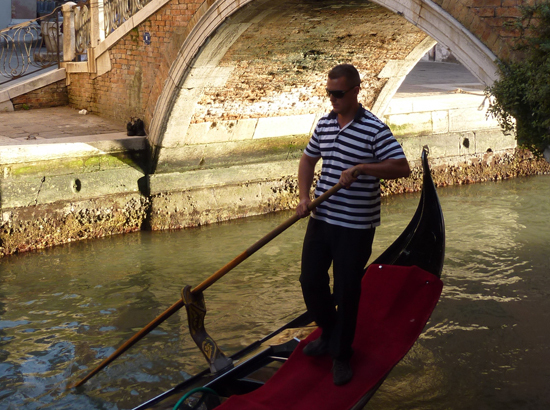 The gondola is a traditional Venetian rowing boat with a flat bottom, which enables it to navigate in shallow water. It's asymmetric structure also serves a purpose: to allow it to travel in a straight line by a single gondolier always rowing on the right side. 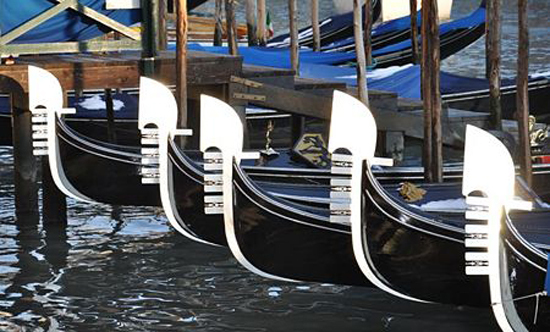 These sleek black boats (the color was a decree from the Venetian Repulic's leader, the Doge, in the 17th Century) are about 35 feet long and 5 feet wide, and weigh about 1,100 pounds. Their detailing varies: the upholstery, the form of the oarlock (forcula) and the carved metal ornament (ferro). Fun fact: the six horizontal lines of the ferro represent Venice's six sestieri (districts) and the top shape symbolizes the Doge's ceremonious hat. While today, the city of Venice has only about 450 operating gondolas, several hundred years ago, the gondola was the chief means of transportation and the Venetian canals were jammed with over 8,000 of them. In the Museo Correr or in the Museo Querini Stampalia, one can see various 16th - 18th Century Venetian scenes depicted by Canaletto and Carpaccio featuring gondolas (though these gondolas have a slightly different form and can often be seen being rowed by at least 2 gondoliers). Until the early 20th century, gondolas often came with a "felze", a small cabin for the passengers. Fun fact: its windows were equipped with small shutters--the first Venetian blinds! Their are gondola stations throughout the city. Gondola rides typically last 40 minutes and cost 80 euros during the day, or 100 euros by night (after 7 PM). The boat can hold up to 6 passengers. Some tourists opt to share a gondola ride with other tourists to save on costs. Contrary to popular belief most gondoliers do not sing, though you can pay for musical company (usually accordion and male voice). Expect to shell out an additional 30-50 euros. - Avoid going to the overly busy gondola stations near San Marco and opt instead for those in Castello, Dorsoduro or Cannaregio. If you want to learn more about Venice's maritime mascot, visit the Museo Storico Navale in Castello, in front of the Arsenale, which has a room dedicated to the gondola. 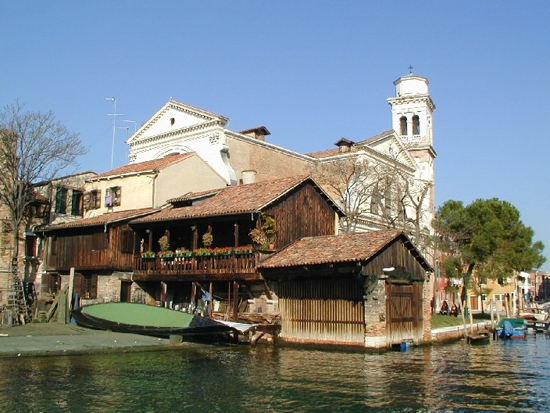 Or, when in Dorsoduro, a must-see is to pass in front of the ‘squèro' (boatyard) of San Trovaso, just around the corner from the wonderful gelateria Nico, where gondolas are built (usually takes 2-3 months) and repaired. Have you ever gone for a gondola ride? Share with us your experience and send us your pictures! 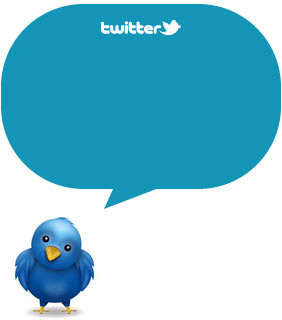 Do not miss our next posts and follow us on Twitter and Facebook. Subscribe to our RSS and we’ll keep you updated !